If you follow me on Twitter, it’s no secret that I hate paying for cable. Yet, in the great compromise* that is marriage, I’ve continued to shell out for cable since those two glorious weeks when we had no TV or Internet at all when we first got married and a certain someone may or may not have likened it to jail time. 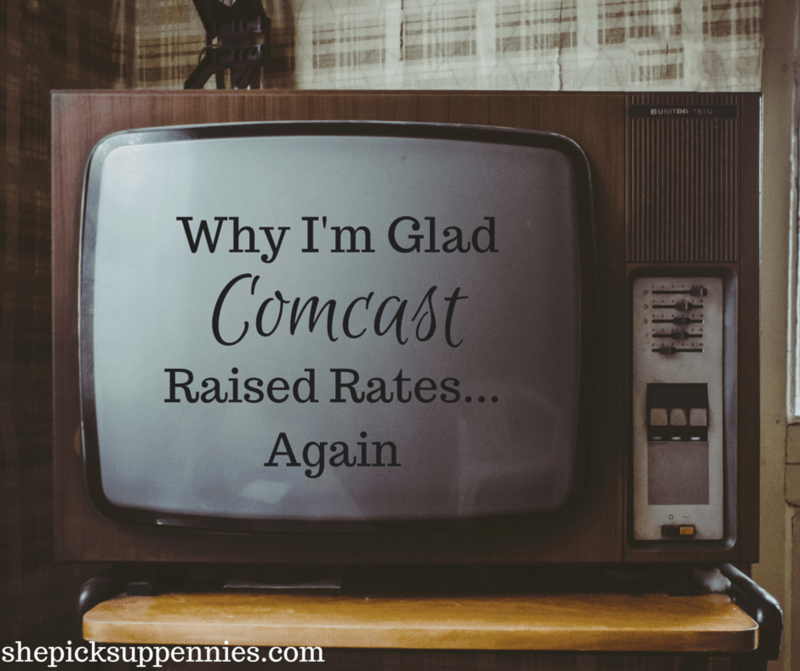 When I got a notice this past month that Comcast was raising our rates again, I was elated. No, it wasn’t the result of delirium or hysteria. ** It was brought about by Mr. P’s quiet acquiescence that we had to do something about our cable bill. At first, I wanted to cut the cable cord entirely. Just once, I wanted to be a real millennial. Seriously. Does anyone my age even have cable? I figured surely I could make the switch to this newfangled Netflix-and-Chill business. But then I investigated further. The bare-bones cable and internet package in my area is $90/month. The same level of Internet*** on its own would cost us $80/month. For now, it makes some semblance of sense to keep cable. But who knows what the next rate increase will bring. That reduction in our cable package nets us a savings of $519.84 per year. Not too shabby. Now if only I could get Mr. P hooked on Serial. The natural transition to Making a Murderer surely is reason enough to figure out Netflix, no? *Mr. P puts up with A LOT, you guys. **Though I felt both delirium and hysteria while waiting on hold for an eternity this entire blog post with Comcast customer service. ***Mr. P is a gamer. Messing with his Internet speed would probably give him the right to actually read this blog. Not going to happen. So Tell Me…What’s your TV situation? Do you Hulu? Netflix? Have you ever had to break up with Comcast? We have AT&T internet for around $61 per month and they give us 20 “free” cable channels. We also use Netflix and Hulu. I don’t watch a lot of TV and we don’t watch sports, so this works fine for us. I do kinda miss cable news! I understand your pain. I have AT&T U-Verse and I HATE IT, but we can’t have anything else because the apartment complex has a deal with them. They slow us down every single night around 9 p.m. and we pay for the fastest internet available (which is only 49MB) and it’s $80 a month. It’s ridiculous. The first year is discounted and cheap, but after that, they really get you. I do not recommend them. If you have Charter or Time Warner in your area, I would try them. They offer comparable speeds for around $50. Cannot wait to move somewhere else! As for TV, we do Hulu and Netflix for around $15 a month. It is worth it. Can I tell you how happy I am that you’re back in the blogosphere, Liz? Thank you for the recommendations! Oh thank you! I’m glad to be back! If only I had more time! Tech school is taking up so much of my time, but I’m trying. Love reading your posts! I think his intention is to go from U-Verse to TWC again. That usually works for 6 months or so, and then you’re back to having to wrestle with the cost. My fingers are crossed that you can get a better deal! We use Amazon Prime streaming and Netflix through our Roku, we cut cable over a year ago, I think, and we’ve just noticed that we don’t keep up with movie trailers, ads, and a small amount of current events. I get my news from Twitter 🙂 PiC was into Food Network and Animal Planet but he hasn’t really missed them since we cut it. I loved TNT but I can get plenty of other shows to stream so we’re pretty well set. We pay $40/month for reasonable internet from Comcast (I bought our own broadband modem to replace the 10 year old one we had but that cost is made up over time, as is the Roku cost), Netflix is about $10/month and Prime is already paid for because we use it for shipping, the streaming was just a bonus. We have Comcast, but broke up with the bundle deal! We only have internet (only because it’s the fastest available speeds in our area in comparison to competitors). We have a Roku and stream everything on Netflix, YouTube, etc. I am not one for watching TV, or things in real time, so this works great! The biggest hurdle is sports for my fiancé. If there’s a big game, we try to find a free watch party around town (but this could end up to purchasing drinks/meals in the establishments). Oftentimes, he can find it online and stream with no hassle – or we head to his parent’s house. Once cable is gone, it’s amazing how much free time comes about! I think it’s been over a year now that we have done so and I can’t even believe that much time has gone by. I would much prefer to read, read blogs, or blog. I do binge watch DVDs from the library (I am seriously a 97 y/o in disguise) on occasion. And I have to watch Big Bang Theory and How to Get Away with Murder in their current seasons. Other than that, I could care less about TV. 🙂 Good call on going out to watch games at parties! What are the key channels that are keeping you guys hooked? We cut cable about a year and half ago and love it, but it was a huge loss for sports. I always just assumed sports was always the issue. There’s rumors that the NFL is going to sell direct next year. If that happens, it’s the nail in the coffin for traditional cable packages. Sports was the issue for me at least. Until the Bears and this season. Oof. I drove to my parents’ house for the games that I could stand to watch 😉 Mostly, my husband is glued to Animal Planet, History, Discovery, and a few others. I *think* I could get him to do some streaming online, but I’m thinking it probably won’t happen before summer break. I’m seriously DYING to watch Making a Murderer…so I’m thinking that might be my in! And you’re absolutely right about the end of cable if NFL sells direct. I hope that’s true! We have Verizon FIOS and while we’d sorta like to ditch cable, live sports during baseball season are important to me. Our monthly bill is in the same neighborhood as yours, only we also have a landline included in that price. Yes, we’re old and we like our landline (in addition to our smartphones), and getting rid of it probably wouldn’t save us all that much. Anyway, while the sports issues exists, we’re stuck with cable company negotiations. Glad to know someone is paying something comparable to us. This summer, we might experiment with Internet speed. As of right now, with what Internet costs, getting Netflix and Hulu and all of that would probably be similar to the cost of our reduced cable package. Thanks for commenting, Gary! We totally cut the cord, Penny. We use Netflix, watch YouTube and usually listen to Dave Ramsey at night. I’ve grown accustomed to the lack of droning background noise. It’s wonderful. Time Warner did it for us in increments, without knowing it. We stopped paying, but they kept all our stations on for about 6 months. Then over a period of about 1 month we started losing several each day until we had none. That’s really interesting that you kept your stations for so long. Mr. P was channel surfing while I was on the phone with Comcast, and the channel he was on went down right as I hung up the phone! Whoops. We got sick of paying for cable — especially since we were subsidizing the in-laws in the guest house to the tune of $27 a month. So we bit the bullet and went to Hulu. There are a couple of shows we miss/hate waiting for Netflix to get. But by and large we don’t miss cable. And that’s saying something for 2 people who are home all day every day! I’m thinking this will be our great summer break experiment of 2016. Netflix and/or Hulu. I’m really content with library DVDs. But these swamp people/Alaska folks/sharks have a hold on Mr. P.
Oh, Comcast. They’re our only option here, and I’ve had some pretty rough times. I canceled cable back when I got into credit card trouble and needed to save money. I even lived without Internet for a while. I’d drive to a parking lot and use their wifi to blog. :-p But then I met David and no Internet was a deal breaker for him. Luckily I convinced my employer to pay for our Internet since I use it mostly for work. We have Netflix and HBO Go to entertain us in lieu of cable. I didn’t know HBO Go was a thing. I’m loving all of these comments. Blogging in a parking lot. No wonder I loved your blog so much! The dedication 🙂 That’s also really great that your employer pays for Internet. We cut cable a year ago, so glad to trim our bill to Charter down to just internet. We bought digital antennas, one for each tv, and get about 15 channels. I’ve heard the antennas and channels you get are subject to your area, though. Then we use Amazon Prime through our Roku player. There is enough for us and the kids with those options, for the most part. For sports (I’m a baseball and college football nut), I bought the MLB package this past season at about $130 (hate the blackout rules, so arcane) and watched football on regular tv (free with the antenna). When college football bowl season came around, I found that most games were on ESPN (not a big fan of them, but they get so many games). That’s when we found a channel on Roku called Sling TV…$20/mo and gives us ESPN, ESPN2, TBS, TNT, AMC, HGTV (wife’s favorite), History, and more. More than we want to pay, but we get a lot with it. I rarely ever watch TV, but I would seriously struggle to get by without internet TV. I lucked out with all those years on cruise ships, since it broke all of my normal TV viewing habits. I routinely break up with Comcast. We “have cable” whenever there is a promo. Honestly, we don’t even hook up the cable box; we use the free HBO for Game of Thrones, then turn it off again. We pay $70 for just Internet, $10 for cable ATM.